Bun divider rounder used for dividing and rounding dough balls for pavs, buns etc. Technical Specifications : 25Kgs Capacity with 1 H.P.Ele. Motor. - 30 Divisions Range 40 - 135gms. - Dough Capacity 4000gms. with 1 H.P. three phase Ele. Motor. We are offering Bun Divider Rounder with three moulding plates. Using latest technology in our production process, we are able to provide our clients with a quality range of Bun Divider Rounders. These are primarily used for giving the round shape to the buns and are used in various bakeries. Our range of Bun Divider Rounders is available in various specifications as required by our clients. - Dividing dough evenly and founding as easy. 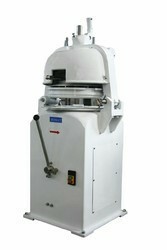 - Machine head can be tilted for easy cleaning of knifes. Shristi Food Equipments Exim Pvt. Ltd.